I’m so excited to reveal it to you. I’ve got lots of great posts planned, and now that I’ve updated everything I’ll be able to get your feedback and you’ll be able to follow. I really appreciate you, faithful readers! I’ve created this new site so that I can blog more effectively, plus get out information that I think you’ll find interesting and helpful (check out the pages on the site). If you’re here for the first time, you can find out more about me by checking out the “About” page at the top. I hope you’ll consider following me in at least one of several ways that you’ll find in the sidebar to the right. Add my blog’s feed to your reader, follow by email, even follow me on Twitter! I really appreciate your participation in what I’m doing and I hope you’ll benefit from it. I look forward to your comments and getting to know you via this little spot on the Web! Because I’m so excited about launching this new site, I’ve decided to do a fun giveaway to get things kicked off! One of the things you have to know about me is that I’m a hopeless romantic. Jane Austen being the epitome of hopeless romantics, I’m a big, big fan. I’m giving away a copy of A Jane Austen Devotional! 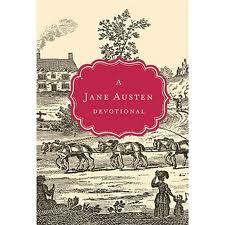 A beautiful devotional, brimming with the wit and wisdom of Jane Austen and the timeless truths of Scripture. The works of Jane Austen can transport a reader to a world that exudes beauty, peace, wisdom, wit, and love. Captivating audiences for 200 years, the works of Jane Austen continue to capture today’s readers in droves. This daily devotional includes short excerpts from the Austen classics, and a devotional thought and Scripture that meaningfully translates to women’s daily lives. Offering temporary transport to a simple and peaceful place, women will love taking a moment to revel in the beauty and truth of a Scripture paired with excerpts from Northanger Abbey, Pride & Prejudice, Sense & Sensibility, Persuasion, Mansfield Park, and Emma. This book is beautiful. The cover is cloth and makes me feel wistful and romantic just holding it. And putting together the words of Jane Austen and the words of God? Inspired genius. I.love.this.devotional. So I think you should have a copy. – If you are a returning follower, tell me what you like about my new web home. – If you are a new follower, tell me a little about yourself and how you came to find my blog. All names will be put into a hat and one name will be randomly selected. The contest will remain open until Tuesday, March 6th, and the winner will be announced via my post on Wednesday, March 7th! So tell your friends and family, Twitter followers, Facebook friends, other bloggies, and anyone you can think of. You’ll be helping me gain new followers for this site, and you’ll have a chance to win this beautiful book! Thanks everyone, and good luck!! Share with me: Leave a comment below to enter to win a copy of A Jane Austen Devotional! Woo to the hoo! I like it here AND I can comment AND it’s in my reader! Thanks, Wendy! I’m excited too! Hoping that I won’t have any of the kinks that I had before. Thank you for your support! You’re awesome! Hi Jennifer! I’m a new follower who only visited your site once before (caught it on Twitter). Your new site is beautiful! Hey!!! Awesome! I love the new site! I was so excited, I poked around duringmy early morning this morning b/f your post was even up! Congrats. It’s sooo, soooo pretty! Looks like I’m the first guy, hope others will post. Not a big Jane Austen fan, but I am a huge Jennifer Hale fan. So I guess the best thing I like about most about this new web home is that your here. Keep up the good writing. I’ve been enjoying reading your blog so I decided it is finally time to comment. Looking forward to your new posts. Love, love, love it!! I haven’t gone through all the pages yet, but I’m getting ready to. It’s really pretty, Jenny, and I definitely want to be included in the giveaway drawing! That book is way too gorgeous!! It looks fabulous! I love purple! 🙂 Great job, Jennifer! I heard about your blog from my sister-in-law (Lisa Wilson). I really enjoy reading her blog. Congrats on the new look and soooo excited that I’ll actually get your updates now! (I wasn’t before). Congratulations on the new site, Jennifer! It’s lovely. Very, very pretty, Jennifer. So soft and inviting. Love the new site Jenny! It’s beautiful! Can’t wait to read what you write next! Yay! It looks GREAT! (Of course, I might be just a wee bit biased. :)) Doesn’t it feel good to have all that hard work pay off? Thanks for ALLLLLLLL your help! 🙂 You’re a wonderful friend and I appreciate you so much! Woohoo, Jenny! I have to say, I’m excited! Because I could never get your old blog address in my Google reader. Every time I tried, it gave me an error message. Now I can put this in my Google reader, and I won’t forget about it! How fabulous, Jennifer! I’ve had my eye on that book for a while, for the same reasons you mentioned. What do I love about your new home? I love the gorgeous lavender background. I think I want to paint my bedroom to look just like it. Thanks, Beth! I’m so not a tech person, but I couldn’t find any backgrounds I liked so I made this one myself. I’m new to your blog, but I’ll definitely be a repeat visitor. We’ve criss-crossed paths in the blog-o-sphere (thanks for stopping by my blog, In Others’ Words) — and we seem to like the same blogs because I see your face in the comment sections! Looking forward to reading your future posts. Found you on Twitter because of the two magic words: Jane Austen 🙂 Have a great day! I’m a new follower. My mother is an author (Beth K. Vogt) and referred me to your page. I’m an Austen lover and live in Colorado. I LOVE the outdoors and baking. Hope I win the devotional. I’ve been looking for a good one!